Antique Huge Chinese Famille Porcelain Fish Bowl Guangxu Planter Jardinier. 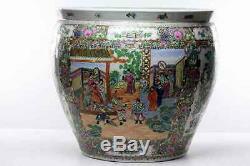 Offering for sale a Very Decorative Famille Rose and detailed Hand Painted Chinese Porcelain Planter fish bowl. This is a very large Planter fish bowl and of very fine quality. The scenes have great detail and are beautifully done with lovely paintings and some raised florals. The six figure mark on the bottom appears to be Guangxu. The four sides each have a medallion scenes. The four medallion Scenes are are: 2 scenes of gardens birds and Florals 1 scene of what looks like royals in a palace 1 scene of what appears to be warriors demonstrating their skills. The six character Guangxu signature on the bottom is shown in photos 8 10 and 12. There are no chips cracks or repairs. The measurements are as follows: 18 inches in height/ 20 inches in diameter around the top opening. / 13 inches diameter across the bottom. We describe our items to the best of our ability and guarantee them 100% as described. If there are any problems with our description (very rare, please check our feedback) we are very professional and will work to correct any issue that might arise in a timely manner. We take a lot of pictures to show the items the best we can. ATTENTION TO OUR INTERNATIONAL CUSTOMERS. We welcome international customers and appreciate your business. On higher cost items we will try to work with you in any way we can to minimize the cost. The item "Antique Huge Chinese Famille Porcelain Fish Bowl Guangxu Planter Jardinier" is in sale since Tuesday, November 3, 2015. This item is in the category "Antiques\Asian Antiques\China\Bowls". The seller is "robertsilver" and is located in Orleans, Massachusetts. This item can be shipped worldwide.